Avalon II, Microgaming’s sequel to its immensely popular Avalon slot, offers players 243 ways to win and plenty of opportunities to win payouts through eight bonus games. Since Avalon 2 comes with 243 permanently activated paylines, they do not have to manually select any payline. The slot demands a minimum bet of $0.30, but players who would like to bet more can increase their bet size in increments of $0.30 up to $7.50, which makes it one of the most affordable slots in the world, especially considering the fact that there is a top fixed jackpot of 7,500 coins to play for. Based on the medieval theme of King Arthur and his brave knights, Avalon II gives players a chance to experience the charm, mystery, chivalry, and adventure of the medieval age. 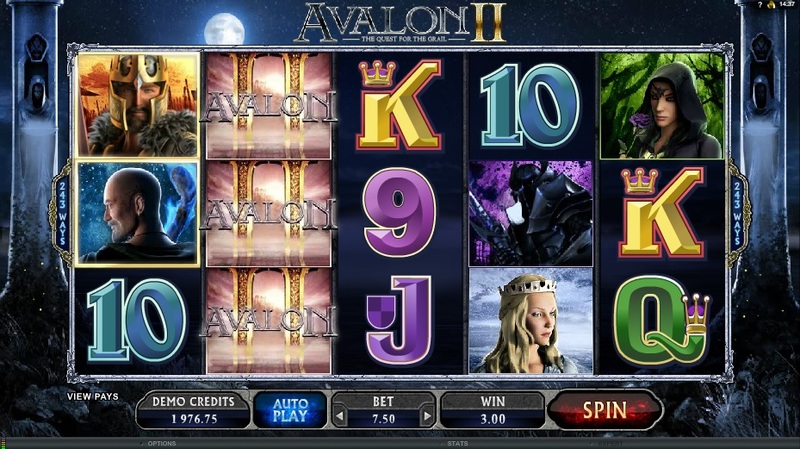 In terms of graphics, audio effects, and animations, the slot resembles the original Avalon slot. Players will come across familiar icons of the Lady, the wizard, and others along with high-value playing card symbols. The slot delivers several hours of entertainment with plenty of prizes. The Lady of the Lake symbol in Avalon II slot not only serves as the expanding wild, but also as the multiplier. Whenever players land a Lady of the Lake symbol, it expands all over the reel, substituting for other symbols and helping players complete winning combinations. The Goblet symbol functions as the scatter; it pays irrespective of its location across the reels. Another special symbol that players must look out for is the Merlin symbol, which unlocks a mystery multiplier whenever it appears along an active payline. Avalon II enjoys a great deal of popularity for its not one, but eight bonus features, which translate into plenty of opportunities to win payouts. These bonus features are called Legend of the Lake, Whispering Woods, Misty Vale, Dusky Moors, Forest Falls, Hall of Shadows, Morgan’s Keep, and Isle of Avalon. Players need to land at least three Goblet symbols anywhere on the reels to unlock these bonus features. The aim of the first bonus game, called the Lake of Legend, is to re-forge the fragments of Excalibur, the legendary sword. This is a dice roll game that gives players a fragment of the sword and a multiplier value with each roll of the dice. Players can roll the dice up to ten times. If they succeed in re-forging the sword, they will get a bonus of 15 times their bet amounts. Each bonus feature comes with free games, multipliers, extra wilds, and other lucrative features that slots players love. Avalon II enjoys a great deal of popularity thanks to its mystery multiplier value of up to x20 and the opportunity to win up to 2,430,000 coins in the free spins.